Today we were in for a very special treat - we went to the Minack Theatre to see The Last Night at the Proms Concert, and very lucky we were to get tickets too. When I first looked on their web site it said ‘SOLD OUT’, so we were quite disappointed and thought we'd have to settle for a visit just for a look around the outside. However, on the off chance of cancellations I emailed them to see if any seats had become available, and their reply came back to say YES! Therefore, I quickly phoned and managed to snap up two tickets. And it was absolutely fantastic. The theatre is set into the cliff side and the seating is on stone tiers that are steeply terraced down to a platform/stage area where the performances take place. But once again our luck was in when it came to finding our places in the auditorium because we were very near the front and the day was perfect - with warm sunshine and clear blue skies. However, we had been forewarned that even on good days it can become very cold on the terraces because the sun soon sinks behind the seating area - which it did today at about 3.30. I suppose the clue was in the queue - lots of people had big coats, warm blankets and cushions with them. Anyway, we were fine because once we got in it was possible to hire (for £1) a ‘cushion/chair’ which provided us with a reasonably comfortable seat throughout the performance, and it didn’t start to feel too chilly until near the end. The audience area is arranged with 'seats' either on stone ‘ledges’ or grassy steps so you definitely need something to sit on, and it is also very snug with very little elbow space - I suppose it’s so that they can get as many people as possible for each performance - I think the theatre holds about 810. However, your mind is very quickly diverted from where you are sitting because to say the setting is stunning is an understatement, and the music, although only provided by a band (rather than an orchestra), and a couple of soloists (trumpet and vocalist), was magical when set against the backdrop of the ocean. Also the atmosphere was very special, with people waving flags and joining in, as they always do at proms events. The finale of William Tell's Overture, accompanied by day time fireworks was also spectacular and the memory of it will stay with me for a very long time - can you tell we really enjoyed it! The concert finished about 4.30, and then we still had to walk back along the coastal path to the Tardis, but as we had already trodden this part of the path before we were well prepared for the ups and downs, and even though it was about 2.5 miles we enjoyed our walk home! Not much to report today - It was another moving day and we were aiming for Tenerife - Tenerife campsite on the Lizard Peninsula that is! 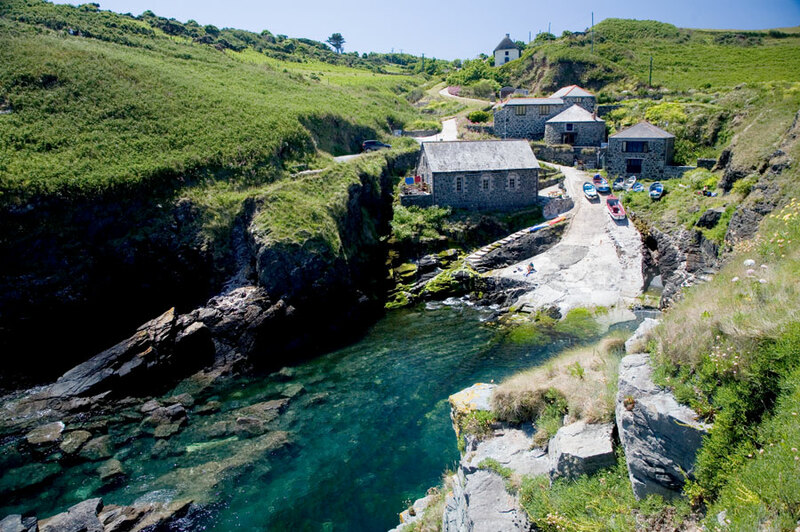 We chose this site for several reasons, it is owned by The National Trust of which we are members, it looked really good on the website and it’s position, right near the coastal path made it ideal - oh and it was quite cheap. Ha Ha, you get what you pay but more on that later. We arrived about 2ish, and were quite happy with what we saw - the facilities looked a bit ‘dated’ but they seemed functional so we booked in for the next 5 nights. We were also happy to learn that the site had a laundry with both a washing machine and tumble dryer - after just over 2 weeks we had lots of washing! So off I toddled and did 2 big loads, thinking I would be able to get it all dry - WRONG! The dryer tumbled but didn’t get warm, so after 30 minutes my washing was almost still as wet as when I put it in, and for my troubles, I had a very large pile of wet washing! By the time I had done I was very grumpy and it was nearly 9pm, and we still hadn’t had tea! But there was nothing much we could do about it that evening but the next day the Tardis ended up looking like a Chinese laundry with pants, socks and all manner of other attire hanging both inside and out of every orifice - luckily it was another sunny windy day so we soon managed to get everything dry. Then we continued on into the village itself which turned out to be another pretty little settlement that provided a couple of eateries, a village shop and a few galleries but not much else so we were quickly back on the coastal path and heading back to the Tardis. And it was at this point that we learnt just how ‘dated’ the facilities on the campsite were. John decided to go for a shower, and he duly took his 20p with him(the amount that we'd been told showers would cost). He wasn’t gone long and he came back very underwhelmed!! He said the shower really only managed to ‘spit’ at him, and that the water only came from one side or the other (not the middle) which resulted in him having to dodge about to catch the drips, and then to add insult to injury, it cut out altogether after only 2 minutes. Needless to say, after his tale of woe I had my shower in the van!! Today was to be another Coastal Path walking day, but I was quite excited because we were heading for Kynance Cove - a place we've visited a couple of times before - and one that had always left a lasting impression because of it's sheer grandeur and beauty. We left the camp site and followed the dead end road to the Coastal Path and joined it at Lower Predannock Cliff. We then passed by numerous coves and rocky outcrops - George's Cove, Vellan Head, Pengersick, Soap Rock, The Horse and Rill Point to name but a few - and there were also the usual ups and downs through the deep clefts and high cliffs that make up the Cornish coast line. 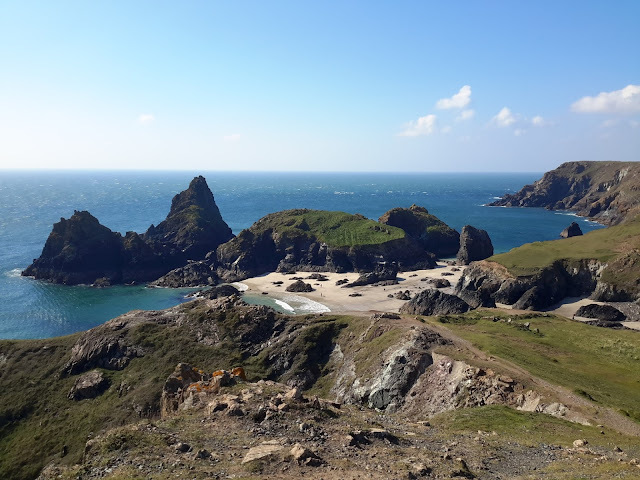 Luckily, when we got to Kynance (which is considered to be one of the most beautiful beaches in the world), the tide was right out so we were able to spend time exploring the sandy areas and caves that would later be entirely covered by the sea at high tide. Our time there brought back fond memories of being there with our children eating Cornish Pasties on the cliff side, and today we replicated the experience and ate our picnic overlooking the cove. After lunch we continued on our way and passed Pentreath beach, Caerthillian Cove and Halseer Cove and eventually came to Lizard Point where the coast line becomes very jagged and littered with numerous rocks and small islands. It was here, in 1907, the Star liner SS Suevic came to grief by hitting a rock in dense fog and this fact is now recorded in The Guiness Book of Records as the RNLI's biggest ever rescue, with lifeboats from the Lizard, Cadgwith, Coverack and Porthleven attending, and all 382 passengers and 142 crew being rescued without any loss of life. From here we were undecided weather to turn back or to continue on to Church Cove - another venue we have visited several times - we continued on ! The properties you can see are holiday lets and on more than one occasion we have enquired about staying there, but they've never been available. Maybe we'll get lucky and have a 'holiday' there sometime in the future! By this time it was getting on for 4pm and we still had quite a long trek back to the Tardis, so we set of briskly (up hill) to Lizard Village where we were distracted by the many Ice Cream signs - it would have been rude not to stop. Also visiting Lizard had 2 benefits - it allowed us to enjoying our sweet treat and it also cut a couple of miles off our return journey by providing a short cut back to Caerthillian on the coastal path. By now the tide was well on it's way in and when we returned to Kynance nearly all of the beach was covered with water - so we got to see it in both it's guises! All in all we think we walked about 14 miles so we gave ourselves a pat on the back and promised ourselves an easy day tomorrow!! An easy day coming up, and it was another lovely sunny one so it wouldn't be any hardship to be lazy! John pottered around the van doing necessary chores and I did a bit of Baking - flap jack and cake! And then we put our feet up and just enjoyed the sunshine. However, by about 2.30 we got a bit restless and decided to go for a short ride (maybe the ulterior motive was being able to collect a nice cool cider form the village shop). Now the ride was superposed to be easy, and I suppose, at only about 8 miles, it was - however, nowhere in Cornwall seems to be flat, so our easy ride included 2 big hills - oh well, at least it burnt a few calories off before we replaced them. We rode to Poldu and sat up on the cliff side watching the time coming in before peddling back to the Tardis for a bit more sitting and reading with a nice cool cider at hand - I told you it was going to be an easy day!